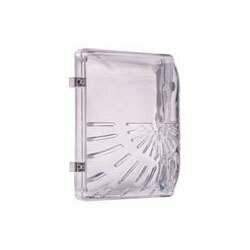 Brand: Safety Technology International, Inc.
Safety Technology International, Inc. - STI 1210E Horn/Strobe Damage Stopper and open back box for flush mount. Unique, patented device that's been helping stop false fire alarms around the world for almost 30 years without restricting legitimate alarms. This virtually indestructible cover molded of clear, thick, UV-stabilized polycarbonate material is designed to stop vandalism and accidental damage. Slots in the STI-1210E allow the horn to be heard. Features an open back box for flush mount applications, with knockouts for exposed conduit. Provides easy access for maintenance and service. MEA approved and UL Listed to U.S. and Canadian safety standards. 3-year guarantee against breakage in normal use. Safety Technology International, Inc. "We protect the things that protect you"
If you have any questions about this product by Safety Technology International, Inc., contact us by completing and submitting the form below. If you are looking for a specif part number, please include it with your message.